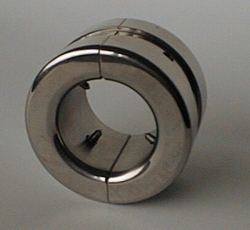 These ball stretchers are just as universal as the BS range but have also four spikes that can protrude inside about 8 mm but can be retracted also till they are flush and do not protrude at all. All options from the BS range can be used at these ball stretchers also. External spikes are also optional available. Height 40 mm. Made from high grade stainless steel.